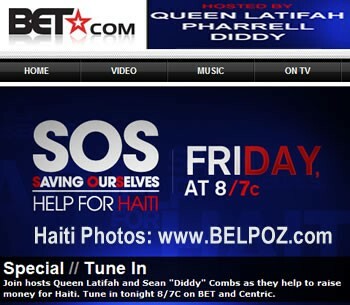 BET held a live Haiti telethon concert in Miami called SOS 'Saving OurSelves' Help For Haiti. The event took place Friday Feb 9 2010. Wyclef opened the BET Help for Haiti telethon. Joining him on stage were members of Haiti rap Kreyol groups Barikad Crew and Rockfam, and Jamaican dancehall artist Mavado. The Haiti Telethon was hosted by Queen Latifah, Pharrell Williams and Sean "Diddy" Combs.